This easy black bean soup recipe is a great way to get in a fantastic dose of protein through a tasty and simple meal. Made with cumin, onion, and garlic, this simple bean soup has tons of flavor and requires minimal effort to put together. You can make this vegetarian black bean soup very easily through the use of canned black beans. This makes the recipe a dump-and-stir kind of meal that’s perfect for busy weeknights or lazy weekends. While black beans have their own delicious flavor, the ground cumin, chopped onion, and garlic cloves really enhance the flavor of this easy soup recipe. 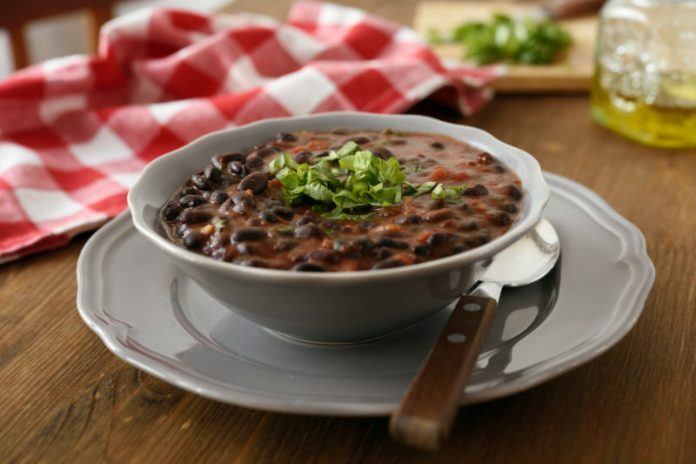 To top it off, this black bean soup is garnished with yummy ingredients like red onion and fresh cilantro. The best part of this black bean soup recipe is that it can be made ahead of time and frozen. Make a batch of this soup on Sunday night, then freeze the rest for quick meals throughout the following weeks. Set a large pot over medium-high heat. Add the olive oil, then when the oil is hot, add the chopped onion. Sauté until the onion is translucent, about 3 to 5 minutes. Add the ground cumin and sauté for 30 seconds. Follow with the garlic and cook for another 30 seconds, until fragrant. To the pot, add 1 can of black beans and the vegetable broth. Stir to combine, then bring to a simmer, stirring occasionally. Remove the pot from the heat and use an immersion blender to blend the ingredients in the pot. Alternatively, you can use a blender or large food processor. Transfer the ingredients back into the pot when you're done blending. Add the remaining can of black beans to the pot and put the pot back over the heat. Bring the soup to a simmer. Add a pinch of salt and pepper, stir, then taste-test. Serve the black bean soup with some chopped red onion on top and fresh cilantro.